'Look Mom, I caught a crab!' 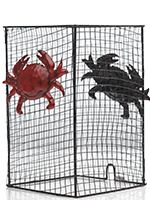 This playful, black metal 'net' has captured two sassy, bright red crabs and will capture your heart. 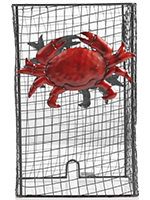 The crabs are attached by a bendable piece of metal that allows you to adjust their positioning to your liking. Measures 5.25” diam x 8.25” h.